Lot of hellonext users had a tough time putting every requests in the same box. hellonext helped to listen to our users way before they fed up with the “lack of categorizing” and helped us to put them in roadmap. 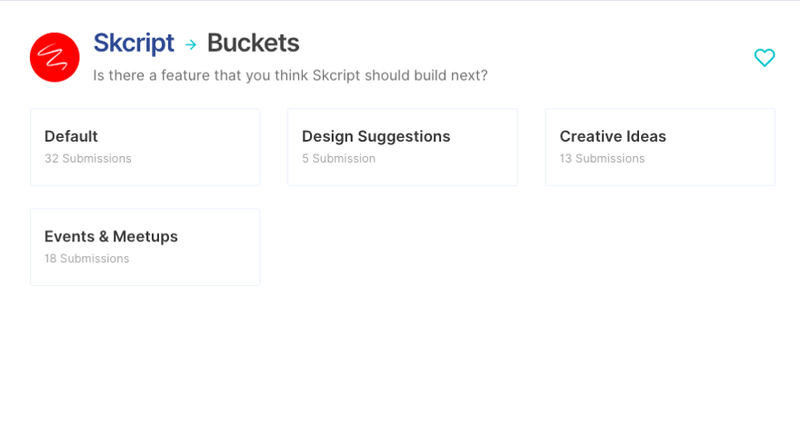 And finally we are very happy to announce buckets along with a lot of exciting features. Buckets. What can I do with them? We were trying hard to find a super name for this “Categorizing” feature and after a day of thinking, we landed upon “Buckets”. To make it easy to understand, Consider a company with buckets like below. This bucket-ing not only helps to categorize, but also enables easy managing within a team. One team member can take responsibility of “Design Suggestions” and another person can be responsible for the “Events & Meetups”. We didn’t stop there. We also introduced “Private Buckets”. Private Buckets helps you to manage ideas/suggestions within your team members and it is not visible to public. This way, ideas and suggestions can be discussed within the team before letting out to the public roadmap.